Ronnie Harrison, FS, Alabama (NCAA): I might as well reserve a spot on this list every week for one of Alabama’s defensive backs. The top-ranked Crimson Tide have made scoring defensive touchdowns a habit — they have 11 this season to lead the nation — and it seems all of their DBs have been getting in on the act. Sophomore safety Harrison, senior safety Eddie Jackson, sophomore cornerback Marlon Humphrey and sophomore “Star” Minkah Fitzpatrick have all found the end zone this season. The only ‘Bama starter who hasn’t yet scored a touchdown from the secondary is junior CB Anthony Averett. 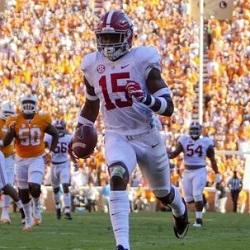 In the first quarter of Saturday’s 49-10 rout of 9th-ranked Tennessee, Harrison was lined up alongside the linebackers when he jumped the route on a screen pass, intercepted QB Joshua Dobbs and coasted 58 yards for a touchdown. Harrison finished the game with seven tackles and two pass breakups. Andre Hal, FS, Texans (NFL): Struggling-turned-serviceable QB Brock Osweiler and the offensive playmakers made the headlines, but Hal made one of the biggest plays during Houston’s 26-23 win over the Colts on Sunday. With about 2:20 left in the fourth quarter and the Texans trailing by a touchdown, Hal sacked QB Andrew Luck on third down to force the Colts to punt. Houston tied the game on its next possession and went on to win in overtime. The sack was the first of Hal’s three-year pro career. Marcus Edmond, CB, Clemson (NCAA): Third-ranked Clemson got all it could handle from unranked NC State, narrowly avoiding an upset loss when the Wolfpack missed a field goal at the end of the fourth quarter. In overtime, Heisman Trophy candidate QB Deshaun Watson put the Tigers ahead with a touchdown pass. And then on NC State’s overtime possession, Edmond intercepted QB Ryan Finley in the end zone to seal the 24-17 victory. Reshad Jones, FS, Dolphins (NFL): Tying for a team-high with five tackles in the Dolphins’ 30-15 win over the Steelers on Sunday, Jones spearheaded a Miami secondary that intercepted QB Ben Roethlisberger twice and held superstar WR Antonio Brown to just four receptions for 39 yards. Jones picked off Roethlisberger on the same play in which Big Ben suffered a knee injury that’ll sideline him for at least a couple of weeks. Houston Cougars (NCAA): Tied at 31 with Tulsa late in the fourth quarter on Saturday, Houston sophomore safety Garrett Davis got a strip-sack on QB Dane Evans, causing a fumble that was recovered by LB Emeke Egbule and returned for a touchdown. On Tulsa’s last possession, the Golden Hurricane drove to the Cougars’ 2-yard line with seven seconds left. As the clock moved to zeroes, Evans completed a pass to DL/FB Jesse Brubaker, but Houston DBs Khalil Williams and Austin Robinson teamed to bring Brubaker down short of the goal line to preserve the 38-31 victory. Davis finished with 10 tackles to go with the sack and forced fumble. Williams had eight tackles. Sophomore CB Howard Wilson also had an interception and two pass breakups for the Cougars. Rafael Bush, SS, Lions (NFL): Last week, after Detroit’s Matt Prater kicked the go-ahead field goal late in the fourth quarter against the Eagles, CB Darius Slay Jr. snagged the victory-preserving interception on the next possession. Different week. Same script. After Prater’s field goal gave the Lions a 31-28 lead over the Rams late in the fourth quarter, this time it was Bush who got the clutch interception on L.A.’s last possession to preserve the victory. Like Slay, Bush had great coverage on a deep route and stole a pass that QB Case Keenum intended for TE Lance Kendricks.